Black bean collard green rice soup is a delicious Costa Rican style vegan recipe that is great for an appetizer for lunch or dinner, and even as a main meal. 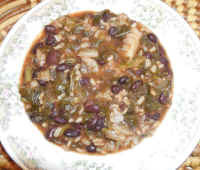 We make this vegan black bean, cabbage, collard green, and rice soup recipe in a large soup pot on the stovetop, and precook the black beans and rice in separate pots on the stovetop or in a pressure cooker. Total cooking and preparation time is about 3 to 4 hours, with plenty of time to do other things while the ingredients are cooking. This recipe will serve about 12 adults as a main meal and twice as many as an appetizer. If you wish to make a smaller amount, cut the recipe in half. Before breakfast, we clean and wash the black beans, and place them in a covered pot on the stovetop with just enough water to cover the beans, and cook on high heat until the water begins to boil and immediately turn the heat down to simmer and cover the pot and continue cooking until the beans are soft, stirring occasionally and adding additional water as needed. After breakfast, we place the covered rice pot on the stovetop with 4 cups of water, turn the heat to high and heat until the water begins to boil. While the rice water is heating, we place the soup pot on the stovetop with 2 quarts of water with the bay leaves, cilantro, and oregano, and bring the water to a boil, and then reduce the heat to medium. Measure out the 2 cups of brown rice, and when the rice water begins to boil, add the rice, cover the pot, reduce the heat to simmer, and cook until all the water is absorbed into the rice, and then remove from the heat. While the rice is cooking, wash the veggies and peel the carrots, garlic and onions. We finely shred all the veggies, including the jalapeno pepper, in a food processor, and add them to the soup pot. When the vegetables and beans are cooked, add the tomato paste to the soup pot and stir well. 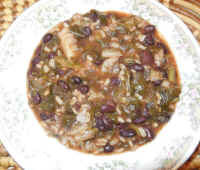 Then add the cooked black beans, mix well, and finally add the cooked brown rice and mix into the soup. Simmer the soup for a few more minutes, stirring to prevent any of the ingredients from sticking to the bottom of the pot. Remove the bay leaves before serving, or caution those eating the soup to watch for the bay leaves and remove them. Leftovers can be stored in a covered container in the refrigerator for several days, and portions can be reheated in the microwave oven before serving. We believe the flavor actually improves the second day.